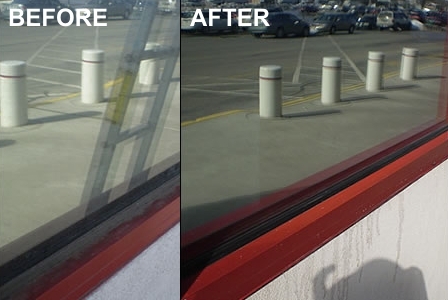 Squeegee Klean is a professional window-cleaning, pressure-washing and gutter-cleaning company providing service to homeowners and businesses throughout southcentral Pennsylvania and northern Maryland. 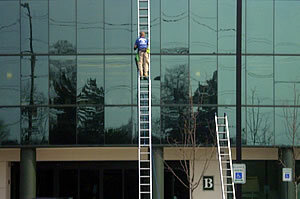 We are proud to be the area’s premier window-cleaning company, and are committed to staying on top of industry advancements and safety standards. We pride ourselves on our customer service, quality workmanship and competitive pricing. Our customers are very particular and expect a high quality of service before, during, and after our services are completed. If this type of service is important to you give me a call today. That’s me, Steve Konarzewski, founder and owner of Squeegee Klean, in the photos above. I would like to thank you for visiting our website. Take some time to browse around and familiarize yourself with our company. I think you will find the content helpful and informative, with answers to many of your questions and concerns. For more information, please contact me by phone or email. I will be happy to respond to any other issues you may want to discuss, and help you choose the maintenance program that best suits your needs.